This is a landmark introduction to the facts and hopes of gene therapy: an exciting, albeit controversial, technique that could bring about a new age in medical treatment. Modern medicine has had relatively little to offer children with disorders such as thalassemia and severe combined immune deficiency. Many of these young patients still face repeated hospitalizations and, often, an early death. In gene therapy, a child with life-threatening genetic disease caused by a defect in a single gene will he treated with the gene's normal counterpart. Successful development of somatic cell gene therapy is potentially the most effective new therapeutic approach to helping these children lead normal lives. With unusual clarity of style, Eve K. Nichols (author of the acclaimed Mobilizing Against AIDS) explores the potential for gene therapy and identifies those who are candidates for it. She reviews methods for diagnosing genetic diseases and evaluates current forms of therapy. 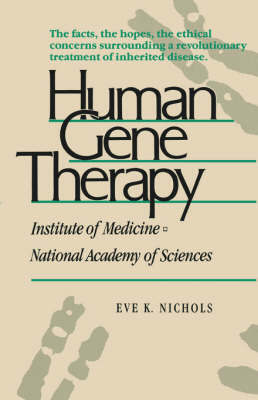 Having provided a biomedical background for understanding somatic cell gene therapy, Nichols takes a thoughtful look at complex and sensitive issues surrounding ethical, economic, and policy aspects of manipulating human genes. A straightforward analysis of the current limitations and future potential of gene therapy concludes her broadly accessible account. This book is is derived from the annual session of the prestigious Institute of Medicine. Distinguished participants in this meeting, such as Leon Rosenberg (Dean of the Yale Medical School), Philip Leder (Harvard Medical School), David Martin (Vice President, Genentech, Inc.), James Wyngaarden (Director of the National Institutes of Health), and LeRoy Walters (Director of the Center for Bioethics, Georgetown University), have contributed expert perspectives that will establish this book as a standard of excellence for future studies. A preface by Frank Press, President of the National Academy of Sciences, provides an insightful overview of this promising new therapy.